The FCM5000 is a fully transparent managed Gigabit Ethernet media converter, which also provides entry-level Carrier Ethernet Demarcation for Service Providers. 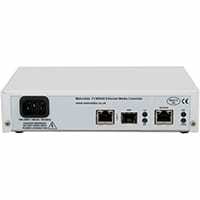 The FCM5000 can be deployed as a fully transparent and yet powerful and versatile Managed Ethernet Media Converter, whilst also offering entry-level copper and fibre demarcation for Carrier Ethernet Service Providers, enabling operational cost reductions via visibility and control of customer connections and services. Comprehensive Management options are supported. In-band remote management can be implemented via the definition of a specific VLAN for this purpose, and includes port-based connection control, status and throughput monitoring, traffic prioritisation and/or bandwidth limitation and VLAN push/pop/forwarding control. Supporting a wide range of fibre connectivity options via flexible 'SFP' pluggable transceivers, the FCM5000 ethernet media converter also supports Tri-rate RJ45 Ethernet transceivers for flexible 10/100/1000Mbps connectivity. Should the FCM5000 Ethernet media converter suffer a loss of power then a Dying Gasp SNMP Trap alarm provides immediate notification of the reason for service loss. The FCM5000 has fully internal power supplies (i.e. no external power 'brick' is required), and is available for either auto-sensing 110V-250V AC or -48V DC operation. The FCM5000 can easily be rack mounted in either a 1U two unit rackmount kit, a 6U eighteen unit rack mount kit. The FCM5000 is part of a range of fibre conversion products from Metrodata. The wider product range offers fibre conversion solutions ranging from 300 baud RS-232, via Nx64kbps rates, through 2Mbps and up to 155Mbps for electrical to fibre conversion; or 155Mbps, 622Mbps or Gigabit Ethernet for fibre mode or wavelength conversion. This application shows a pair of Gigabit Ethernet LAN switches connected over a fibre link using a pair of FCM5000 units providing media conversion. This fibre could be within a building (e.g. between two servers on different floors of a large building), across a campus (e.g. between two departmental buildings of a University) or across a city (e.g. over rented fibre). The FCM5000 can easily be configured for various fibre types by using one of our SFP Fibre or Copper Transceivers. Whilst the FCM5000 Ethernet Media Converter uses industry standard user exchangeable SFPs, it is recommended that these are purchased from Metrodata to guarantee their specification and compatibility with each other. FC7X00: Fast Ethernet copper to fibre conversion media converter, i.e. 10/100baseT to 100baseF, over multimode or singlemode cable, with both short-haul or long-haul applications being supported. FC2X00: Fast Ethernet fibre mode media converter, i.e. 100baseF multimode to 100baseF singlemode, with both short-haul or long-haul singlemode applications being supported. FC-GigE: Gigabit Ethernet fibre mode conversion, i.e. 1000baseSX to 1000baseLX.